We are an eminent organization engaged in offering our reliable patrons an unparalleled range of Corporate Workers Uniform. To offer these corporate uniforms, we have hired tailors, who stitch these uniforms with perfection. 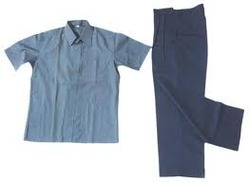 Perfectly stitched, our offered uniforms are designed in adherence with the industry set guidelines. To suit the corporate environment, these uniforms are available in different colors and designs as per the requirements of our clients' and are known for elegant designing and smooth finish. To fit the needs of our patrons, we are engaged in manufacturing and supplying a peerless range of Corporate Workers Uniform. Available in spectacular range of designs, patterns and colors, our offered corporate uniforms are highly applauded by our clients.Additionally, our uniforms are closely tested for stitching, fabric and fitting before delivering these to the customers' destination. Looking for Corporate Workers Uniform ?